These days, a bachelorette party is so much more than a night out on the town with your besties. In fact, more brides-to-be are making entire weekends and special events out of their bachelorette celebrations. What better way to celebrate than by planning the perfect day in Santa Ynez Valley? If you’re stuck for ideas, why not try our unforgettable Vinolorette Package for a day of delectable delights you and your wedding party will treasure for years to come. What could be better than spending your last days as a single lady than sipping on sensational wine and indulging in mouth-watering meals? We can think of one thing – specially designed wine tours for bachelorette parties! Our Vinolorette Classic Package is affordable and memorable. From just $139 per person, you can look forward to a personal chauffeur picking you up in and around Santa Ynez Valley and Santa Barbara. The carefully planned day includes wine tasting at up to 4 incredible wineries, depending on the size of your group. 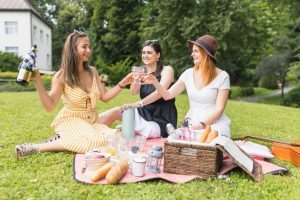 You’ll get to enjoy a catered picnic lunch complete with dietary requirements catered for, and you can take home complimentary bottles of wine at the last winery of the day along with a souvenir Vinolorette wine glass that you can use for the tastings. The entire tour lasts around 6 hours, making it the perfect day in Santa Ynez Valley. If you want to add even more glitz and excitement to your special day, you can upgrade to the premier package that includes limousine transportation, complimentary champagne, and soft drinks, and a mouth-watering charcuterie platter at one of the wineries to enjoy during your tasting session. We’ll even decorate the vehicle for you! Alternatively, let your wedding party travel around in a party bus. We cater for both small and large groups. The party bus also includes complimentary drinks and a charcuterie platter to be served at one of the wineries. One of the most exciting things about getting married is the bachelorette party. Plan a day out you and your nearest and dearest will remember for a long time. Contact Silk Road Transportation today to book your Vinolorette Package. We also offer private airport transportation for your out-of-town guests.